The Amazing EBow :: FAQ - Does the EBow work on bass? The EBow was designed for guitar string spacing. It gets its necessary alignment by resting on the strings adjacent to the one you're playing. 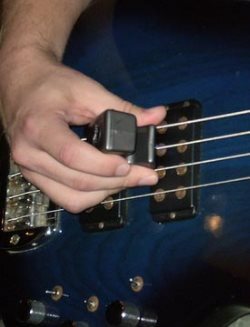 To play the EBow on bass, you must accomplish this critical alignment in challenging ways. You can rest the EBow between the strings and tilt it sideways to get the string you want to play to run down the drive channel. You can use your forefinger and thumb off the edges of the EBow to create "grooves" that catch the adjacent strings. Or, you can just hold the EBow in the proper position through sheer will and determination. Light gauge strings and a touch of distortion can prove useful, especially in the harmonic mode. Click here to view YouTube videos featuring EBow on bass.